Nikon has unveiled the D3500 – the new budget model in its cheap DSLR camera range, and the ultimate successor to the popular D3400. The new camera shares many of the features with its predecessor, but is smaller, lighter, and less expensive than the D3400. Handling is also improved with a deeper grip – and battery life has been given a significant boost to make this one of the best travel cameras for DSLR fans. 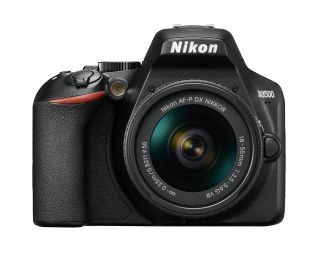 After the razzmatazz of the launch of Nikon's Z7 and Z6 full-frame mirrorless models last week, the entry-level D3500 DSLR was quietly unveiled last night. Like the D3400, the new D3500 uses a 24MP APS-C DX-format sensor and can shoot video in Full HD (1080p). ISO range remains the same at 100-25,6000. It continues to sport a 3in fixed 921k-dot LCD screen to the rear, and 11-point autofocus system. The battery performance, however, gets a 30% boost in performance. With an official CIPA rating of 1550 shots between changes (up from the D3400's rating of 1200 shots). Another key difference between the D3500 and the D3400 is in the size and weight. A few millimetres have been shaved off the design, with the D3500 measuring 124 x 97 x 70 mm (the D3400 is 124 x 98 x 75.5 mm) . The weight of the D3500 body including battery is now 365g (down from 395g on the D3400). Buttons have also been moved around on the back of the camera... the controls that were on the left of the screen on the D3400 are now on the right – so that all of the rear controls are on the same side. This, Nikon claims, makes this easier to use with one hand. The grip has also been deepened to improve handling. The D3500 will be available with the 18-55mm f/3.5-5.6G VR lens for $499.95 / £499 / €539 from September 20. In the UK, it will also be available with the non-VR 18-55mm standard zoom for £479. It will also be sold as a twin-lens kit in North America with the 18-55mm and 70-300mm f/4.5-6.3G zooms for $849.95.